You’ve registered for a booth at a trade show, and the countdown is on to gather everything you’ll need for your space. Friendly, outgoing, and welcoming booth hosts, who fully understand the business and can answer questions? CHECK. Brochures, business cards, flyers, handouts, samples? CHECK. Tablet and/or signup sheets to collect visitor data to add to your database? CHECK. Branded promotional items to pass out and stay top-of-mind after the show? CHECK. Contest and prize drawing? CHECK. Display? NOPE. Hmm, I have a table. Sorry, Charlie, a table won’t help you stand out at all. First impressions are everything. Why not make the best impression? A good display can catch someone’s attention in their split-second decision to pause or keep walking. A good exhibit gives a positive experience to the attendee, and the best exhibit is memorable. No display, or a bad display, can reflect poorly on your company. Here are 5 helpful tips to help you succeed when designing your next trade show display and exhibit area. Start thinking about your booth as soon as you register for the show. Many large-scale print jobs like trade show displays can take 2–4 weeks to print and deliver if you want to avoid rush charges. Whether you design it yourself or hire a professional, allow enough time to finalize the artwork well in advance of the printer’s due date. Allowing 8–12 weeks for design and printing will mean the project is well thought-out, and avoids the chance of costly mistakes due to a rushed timeline. Keeping important information above the waist ensures it is viewable and is comfortable to read without having to bend over. It also will not be hidden by furniture or other booth visitors. Keep your company logo up high so there is no confusion as to whose booth the attendee is in. Do not treat your trade show as a giant information sheet. Try to condense your message down to a few impactful headlines printed at a large legible size, capable of being read from a distance. Make sure your brand has the same look & feel throughout all your signage and promotional objects. This insures a sense of unity of your brand and avoids looking slapped together from seemingly different design efforts. Consistent building materials (wood, metal, glass, etc…). Avoid over-packing your booth with furniture and inventory. You want to keep your booth clean and inviting. Providing this essential space leaves room for a potential viewer to engage with you comfortably. 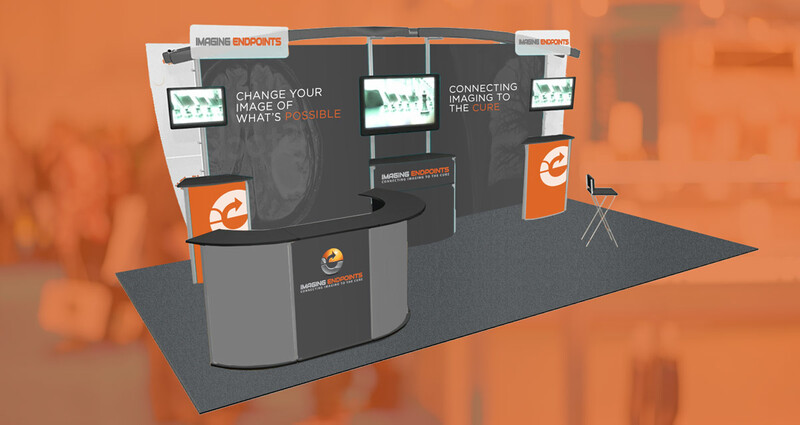 A trade show mockup Davidson Belluso designed for Imaging Endpoints shows the importance of a simple and clean design using interactive elements, and placement of tables and surfaces to allow enough space to move around. 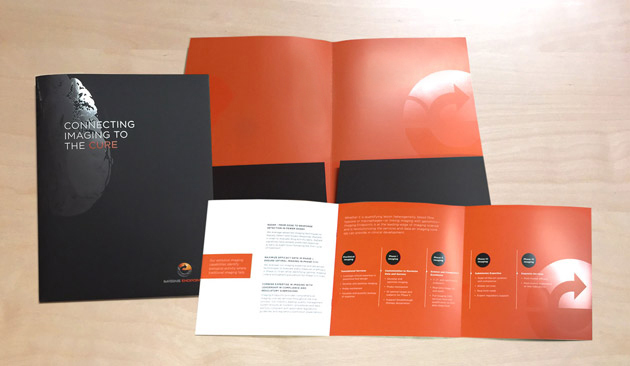 Other branding material such as folders and brochure handouts show how branding was kept consistent across all media. Trade show displays come in various shapes, sizes, and budgets. Set a budget when looking for a display, and include the design fee if you are not designing it yourself. Your display will benefit from professionally-designed artwork that is perfectly sized for each display element and work in harmony with one another. Get the exact design specs from the vendor who is printing the display, and build the art files exactly how the vendor wants them. Instead of standing out with mistakes and inconsistencies, consider adhering to these simple design fundamentals and convey a sense of professionalism to stand out instead. Avoid over-the-top graphics and gradients that make your display look noisy and weaken its overall effectiveness. Design visual lines and graphics to lead the eye to the most important message. 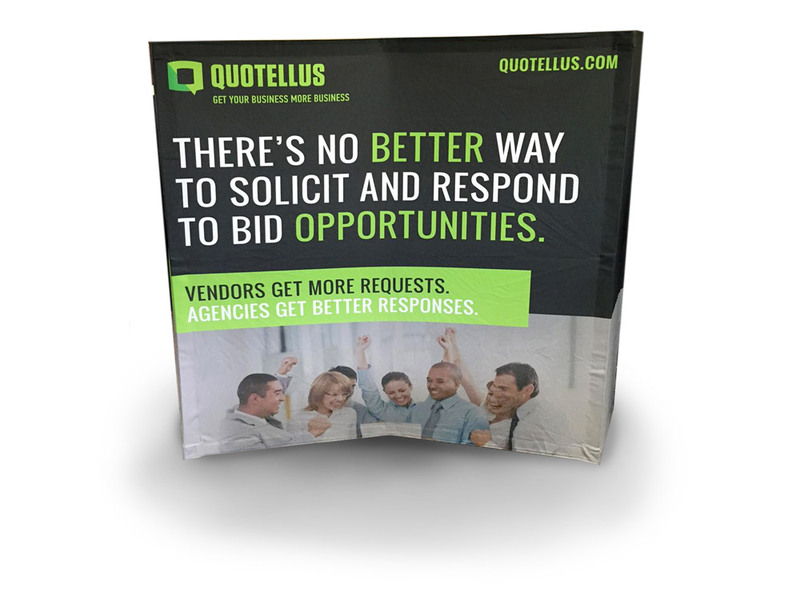 A simple tabletop trade show element for Quotellus was created by Davidson Belluso and features a unique square shape adding dimension to the final piece. 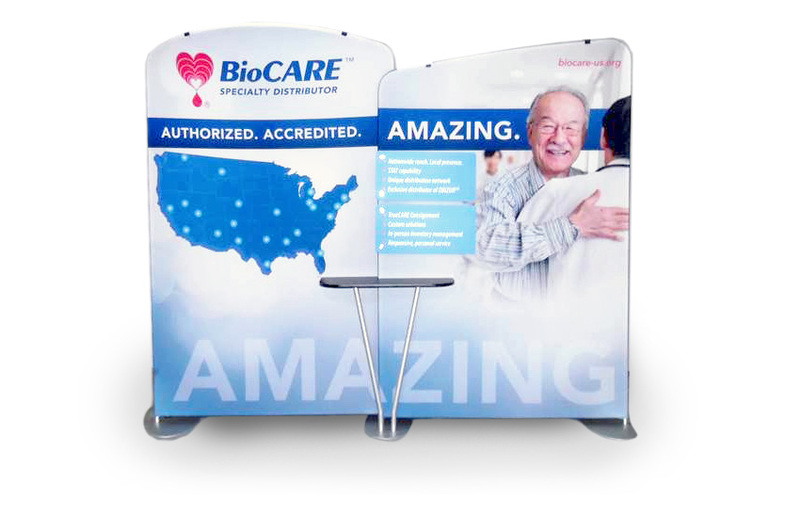 Davidson Belluso designed this simple trade show display for BioCARE which utilizes a unique shape and an integrated table for promotional product placement. When your display is strong, it sets a good foundation for a successful booth exhibit as a whole. 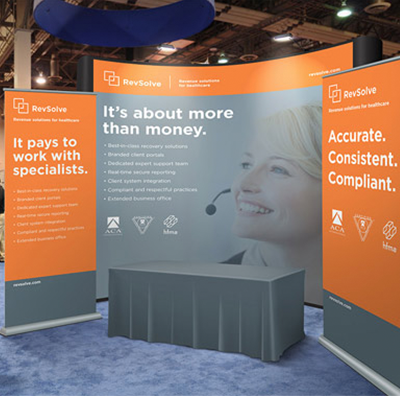 Use these tips or contact Davidson Belluso to help design your next winning trade show display, and you’ll be on a good path to growing your business.